Combat-heavy dungeon games are plentiful across various platforms, so finding a neat hook is always a priority. 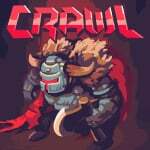 Crawl arguably has that hook, as it blends its awesome visual style with a clever local multiplayer concept - one player is the main protagonist, but up to three friends possess traps and monsters to try and kill them. The goal for the non-hero players is to get the kill and then take over that main role. With playthroughs up to half an hour for snappy matches it sounds perfect for the multiplayer-friendly Switch. Well, it's heading to the eShop on 19th December priced at 12.99 / $14.99USD / €14,99. It's a title that's proven popular on previous platforms - the Steam community seems to bloomin' love it - and is certainly eye-catching. Check out the slightly bonkers trailer below. It could be a fun bit of alternative multiplayer gaming over the festive period, that's for sure. Do you like the look of this? It's fun with friends. My little brother's drive me nuts with it though. Heh, this looks like a riot. That narrator managed to weave a tale in under 3 mins. I love the concept of this game. It's essentially tag made alot more fun. It could definitely be expanded upon too. In many different ways. The price is also really fair. I love this game! It feels like it would be perfect for the Switch with its joycons. I haven’t heard of this until now. Is it fun? @Kirbyfan It's a ton of fun! I played the hell out of it on my XOne, it’s great fun, the perfect game to play with friends, it has all the charm of an eighties old Atari-like game (screen glitches included), but with the mechanics of today. It’s just brilliant, the perfect match for the Switch. Is it always so zoomed in? I can't tell what's going on. It should show the entire room/corridor that you're in while you're playing. It's just the video editing that makes it as you see. Own it on steam for reference. Is just good in single player? Another awesome indie game. I haven't played it myself but I really enjoyed watching Video Games Awesome play it. I'm getting it for sure. I'll play it with my family while I'm visiting them for two weeks for Christmas. Not keen on the art style, will probably pass. Does it have online multiplayer? This looks like loads of fun to play with my family over the holidays. I'll probably pick this one up. Aw cool! I had an idea for a game like this once I just didn't know how to program then lol. I'll definitely buy this! Wow I love the pixel art. The animations are incredible. I'm a huge fan of this game on Steam, been playing it for a while. The art is phenomenal, and works well with the dark-arts-meets-technology theme hidden in there ("prayer.exe not found"). The music is beautiful and dissonant, and it's just an all around cool idea for asymmetrical multiplayer. This is a -perfect- type of couch co-op for Switch, and I highly, highly recommend it! I will buy it again with no hesitation. Really, really worth it! On the Switch, it will even be better! I played the hell out of it in early access on steam, and it really is a match made in heaven for Switch and joy-cons. Insta-buy come release day on switch, and if it's a proper port, I can whole heartedly recommend it to everyone (though 3 players are a minimum for proper fun imo).